New York is considered to be one of the greatest cities on earth, and for good reason. I was fortunate to spend 4 weeks in the Big Apple recently, which gave me plenty of time to explore, visit different neighbourhoods and enjoy some of the best food one earth! Here’s a round-up of the best places I saw, experienced and ate in New York. I visited several museums in New York, but the best by far would have to be MoMA (the Museum of Modern Art). The permanent collection is fabulous, with highlights including my favourite, Starry Starry Night by Van Gogh and the Water Lilies collection by Monet. I also saw the Matisse Cut-Outs exhibition, which was very interesting, demonstrating his ability to transform paper cut-outs into huge works of art with the clever use of colour and pattern. While the Met Museum was also good, I found it too large and overwhelming. But a special mention goes to the Temple of Dendur, an ancient Egyptian temple that was gifted to New York, and is beyond words in terms of both its size and detail. The Highline is an architectural fascination that I nearly missed. On a cold morning I managed to convince my father to join me for a short stroll, that turned into a few hours of leisurely walking from one end of the Highline to the other. Once an elevated freight train line, the Highline is now a public park, scattered with benches, trees (that are a brilliant explosion of colour in Autumn), and artwork. It’s a great example of how something that was abandoned can be transformed into a fascinating space. I particularly loved the sections that encouraged people watching, like this glass wall facing the streets of Manhattan. The Lower East Side, with it’s blend of old Jewish culture and new Chinese communities, intermingled with Little Italy and hipster heaven, is the ultimate melting pot. My first experience of the LES was through the Walks of New York, who kindly took me on tour around the region. The tour explored the first synagogue built by Eastern European Jews in the city, the Eldridge Street Synagogue, with it’s stunning stained glass windows. Interesting commentarycovered a wide range of topics, from the living conditions of the migrant population to the friendly relationship between the original Jewish community and the new Chinese migrants, that are now assimilated within the same space. The street art in the area is also colourful, interesting, and highly entertaining. While you can just look at the Brooklyn Bridge, it’s so much better to experience it by walking along it. The walk itself takes about 20 minutes, but it’s a great way to see downtown, and feel the change in atmosphere as you move from the high rise bustle of Manhattan into the down-to-earth borough of Brooklyn. A great place to take kids is the MTA Transport Museum in Brooklyn. My nephew is obsessed with trains and buses, so my parents and I took him there for a treat, and I think we all enjoyed it just as much as he did. There are some interesting scientific games that are entertaining for both young and old, as well as buses to drive and a walk through historical train carriages. Just perfect for a cold and wet day. No trip to New York is complete without a Broadway show. 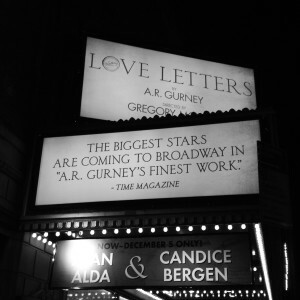 My father treated the family to Love Letters, a classic show that features two people reading out letters exchanged between them over 40 years. The highlight, was being able to see two first class veterans, Candice Bergen and Alan Alda play the leading roles. 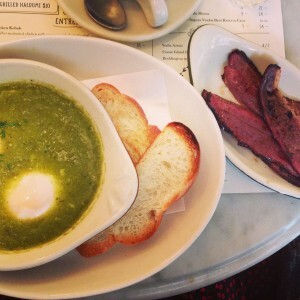 The flavour sensation of duck bacon was a breakfast delight at Jack’s Wife Freda. Succulent and oh so decadent, thank god I can’t find it outside of New York, because I don’t think my waist line would survive! 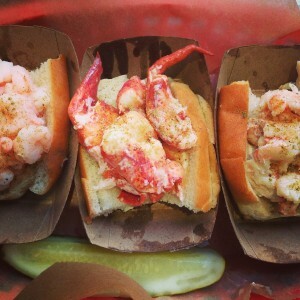 I developed a little obsession with Luke’s Lobster and in particular their Maine special. With a generous tasting plate of fresh lobster, shrimp and crab in a sweet and soft bun. Paired with some classic salt and vinegar chips, it’s such great value for lunch. It’s no secret that I love sushi, but it was a surprise to even myself, to find that my favourite Japanese experience in NYC was a cooked meal of soba noodles at the small cafe, Cocoron in the LES. The meal started with Shiokara; melt -in-the mouth fermented salmon with radish and salmon caviar. 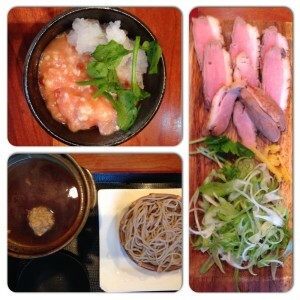 Followed with dip soba (soba noodles that are dipped in a warm sauce) with chicken meatball and the most tender duck. It was nourishing, light and absolutely delectable. I can’t recommend this place enough (and no I’m not paid for this), and even better they also have a vegan menu. My second favourite Japanese moment in New York was at a rather nondescript looking place famous for it’s ramen, Naruto Ramen on the Upper East Side. 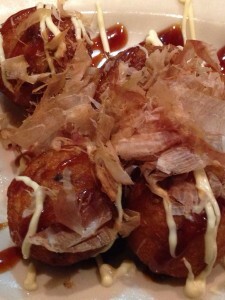 But the stand-out for me here wasn’t the soup, but the Tokoyaki. This was a soft and delicately flavoured octopus and pancake ball. These little pieces of heaven still have me salivating. For a quick dinner, I was a fan of Eli’s Deli, with a huge selection of salads and hot meals to take home. Everything is sold on weight, so you could select what you liked, but the big downside it that prices are a little on the high end. While I did visit the huge Italian mecca of Eataly, for me the best Italian experience I had was at Pagani in little Italy. The lemon pasta was so simple and delicate, that it transported me back to Sicily. 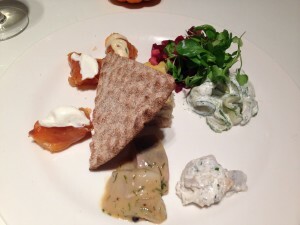 The surprise meal was a Scandanavian delight at Smorgas Chef. I went on the recommendation of an Australian friend, and they certainly didn’t lead me astray. I love cured fish, and the platter of cured salmon, pickled herrings and caviar, coupled with a potato gratin was simply delicious. For dessert, there were two stand-outs. The Canelle Patisserie in Queens serves up an apple turnover that is well worth the trek. 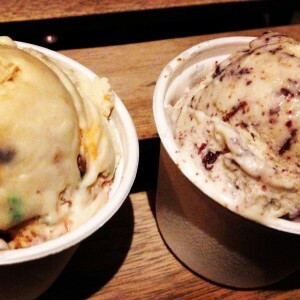 In another borough, Brooklyn, I had the most surprising ice-cream at Ample Hill. The Munchies sounds like a sugar infested mess, with M&Ms, pretzels, chips and everything you need for a junk food binge. But rather than being overly sweet or heavy, it was light and fabulous. As a matter of fact I’ve got a craving for some now!